Let’s be honest, we all love to hate the villain of the piece in a romantic novel, especially if he turns out to be misunderstood and mellows throughout the book. 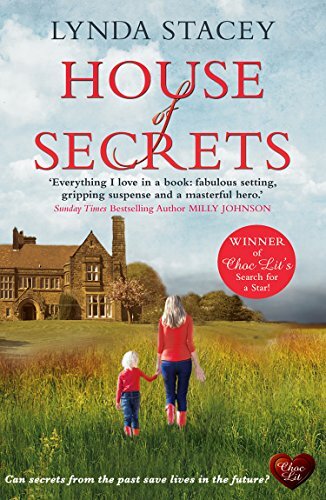 Now I’m not saying that’s the case in this book – I haven’t had a chance to read it so honestly don’t know – but today author Lynda Stacey gives us a bit insight into Liam, the villain from her novel The House of Secrets. Find out about his background, who Lynda thinks could play him perfectly in a film and read an extract from Liam’s point of view. After the launch of my paperback House of Secrets, I decided to take a close look at my characters. Today I look at the villain, Liam. Liam had grown up an introvert. He’d been an only child until he was in his teenage years, when his mother gave birth to his sister. The child was needy and Liam was filled with jealousy, he didn’t want his sister playing with his toys, nor did he want to share his mother’s love. Why was he so obsessive? After the birth of his sister, Liam didn’t like being at home. He tried to focus his attention elsewhere, and at the age of fourteen he noticed Madeleine at school. She’d smiled at him in passing, an innocent action that led to Liam begin waiting in corridors, watching her every move and doing everything he could to be her friend. But Madeleine was already in love with Michael and to her, Liam did not exist. But Liam is not one to let go, he normally gets what he wants and doesn’t care who he hurts in the process. When we first meet Liam, he’s living in his home with Madeleine. He’s controlling and manipulative and Madeleine fears what he will do next. She doesn’t like how he treats her daughter, nor does she want her three year old growing up in such an environment. A good villain has to be bad from the beginning. The reader has to dislike him from page one and I would suggest that he has something to hide. I feel that the villain needs to be interesting, he needs a history, a life story, a reason to be evil. Liam would not have been born cruel or flawed, something must have happened to him to make him bad, something the reader can understand, without feeling too much empathy for him. He needs a depth of character that keeps the reader guessing, that keeps them wondering what he’ll do next. Who would be the perfect Liam? I think Tom Felton would play Liam. He’s the ultimate bad guy and has grown up a lot since 2001 and his days of playing Draco Malfoy in the Harry Potter films. Liam slipped a key into each of the front door locks, knowing that once he entered the house, Madeleine would be gone and his pain would begin. Nevertheless, he stepped through the door with purpose and carefully surveyed his home. He dropped a large heavy suitcase and a shopping bag down in the entrance, walked down the corridor and stood in the doorway of each room in turn. He wanted to see what she’d taken with her, but, more importantly, he wanted to be sure of what she’d left behind. Taking deep, deliberate breaths, he walked into the dining room and allowed his hand to travel across the keys of the piano, the noise reminding him of the days his mother would play and sing. Even then, the piano had been as out of tune as his mother and, though it had been in the room for as long as he remembered, he’d never once thought to learn how to play it himself, or to have it tuned. His eyes glanced down at the pedals. A small piece of blue Lego was trapped beneath and he knelt down to retrieve it, banging his head as he did. He cursed and picked it up, held it tightly in his hand and looked around the room for the box that it belonged in. The Lego had been his, a toy he’d loved as a child and he’d repeatedly told Madeleine that Poppy shouldn’t play with it, but like everything else, she’d gone behind his back and permitted Poppy to do whatever she wanted, in his house, in his absence. He felt the tension build up inside him, the tightening of his stomach and the acceleration of his heartbeat. He threw the small piece of plastic as hard as he could and screamed as it bounced off the wall and onto the dining table, where it landed, with an unimpressive thud. He couldn’t find the box and stamped out of the room and down to the kitchen, where he began opening cupboards. They were practically empty, but what remained was untidy and he began moving what was left into the tidy straight lines that he preferred. Everything had been moved, nothing was how it had been and he kicked at a door with a foot, while his arm swept the entire content of the worktop onto the floor. Warm, almost hot water spilled from the kettle and splashed up onto his sock, making him realise that it hadn’t been long since Madeleine had left. After discovering a diary belonging to a previous owner, Maddie and Bandit find themselves immersed in the history of the old house, uncovering its secrets, scandals, tragedies and, all the while, becoming closer.